Samsung has developed what it calls the first 10-nanometer 8-gigabit LPDDR5 DRAM prototype, a memory module that is faster than the previous generation and is intended to help machine learning applications in 5G-equipped smartphones, and one that could make its way into a future iPhone model. 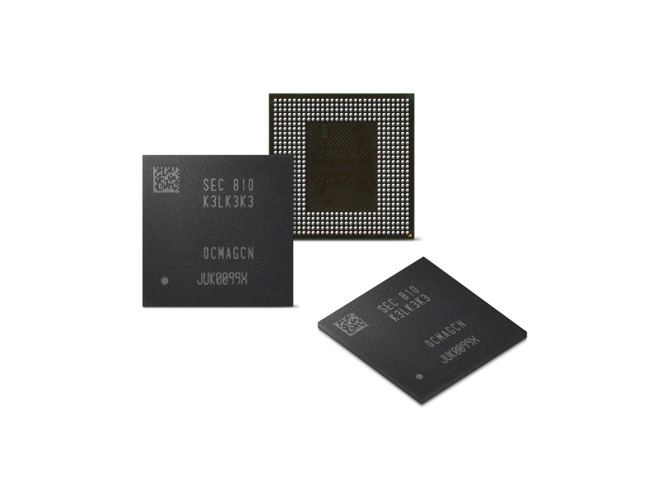 The new memory module is claimed to have a data rate of up to 6,400 megabits per second, approximately 1.5 times as fast as the 4,266 megabit per second LPDDR4X, which is currently being used in smartphones, including the iPhone X. According to Samsung, the LPDDR5 memory is capable of sending 51.2 gigabytes of data in a second, which it equates to 14 full HD video files of 3.7 gigabytes each. Two versions of the 10-nanometer memory will be provided, with the 6,400-megabit model having an operating voltage of 1.1 volts, along with a 5,500-megabit version requiring 1.05 volts. Samsung is also claiming there are a number of architectural enhancements made to increase the bandwidth, including doubling the number of memory banks within a DRAM cell from eight to 16, and the use of a "highly advanced, speed-optimized circuit architecture" to verify performance. To save power, the memory chip will lower its voltage in accordance with the operating speed of the application processor, minimize overwriting cells with "0" values, and have a "deep sleep mode" that cuts power usage to half the "idle mode" of LPDDR4X DRAM. Overall, Samsung estimates this will provide power consumption reductions of up to 30 percent, in turn helping to extend the battery life of mobile devices. It may be a long wait before the memory becomes available to use in consumer devices, as Samsung has so far completed testing and validation of a prototype package. 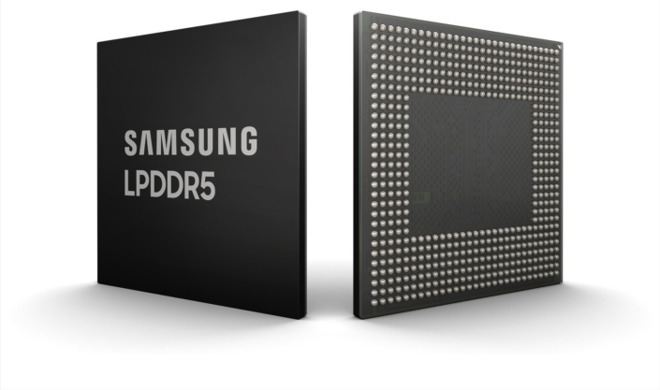 Samsung does plan to begin mass production of the chip, alongside DDR5 and GDDR6 "in line with the demands of global customers," but it is unclear if that means the first devices using LPDDR5 are months or years away. For Apple, LPDDR5 has the potential to help it improve machine learning capabilities the company has started to insert into the iPhone, starting with the A11 Bionic used in the iPhone X and iPhone 8 range. Higher memory bandwidth can allow for faster processing or more processes in a defined period of time. Apple also uses the older LPDDR3 RAM in some of its MacBook lineup, which is roughly half the speed of its LPDDR4 equivalents. The use of that type of memory has been an issue for some time, as Apple was stuck offering a maximum of 16 gigabytes of RAM in its MacBook Pro line due to its use of Intel processors that supported LPDDR3 but not LPDDR4, which would have enabled Apple to offer 32-gigabyte models. The recent 2018 MacBook Pro refresh included the option to buy a MacBook Pro with 32 gigabytes of memory, but the change wasn't caused through using a processor with native LPDDR4 support. Instead, Apple moved to using DDR4 RAM in the new model, memory that is more power-hungry than LPDDR4. Even with the introduction of LPDDR5, MacBook Pro users may not be able to use it until Intel brings out a processor that natively supports it, and that may take some time.